Sweet Goodfellas Shirt advertising "Spit-Shine" Tommy from the Billy Batts scene in the film Goodfellas. In the film, Goodfellas, Tommy doesn't like it when you insult him in front of his friends and even being the 'made' man Billy Batts is will not protect you from the fury of the little guy. 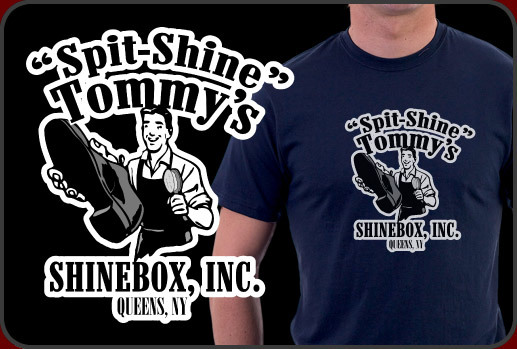 Bring up "Spit-Shine" Tommy's Shinebox and you will surely find your face full of shoe before long. Our Goodfellas Shirt is a funny rememberance of the Billy Batts scene. This is a cool and funny Goodfellas top that's perfect for fans of the movie Goodfellas. Our Goodfellas Shirt looks great on any color material you choose and there are lots of great shirt styles to select too. Get your Goodfellas garb right here! We are your source for great movie shirts like this funny Goodfellas shirt. We have Goodfellas merchandise for men, women and even the little bambinos.